Nothing beats the feeling of seeing the results of all your hard labor out in the streets and media, and that was the case this month with two of the coolest projects as of late I had the pleasure of being a part of! Bionic ladies, shopping malls and cards! Hello! How are you all doing? January already seems pretty much behind and I felt like showcasing here some of the stuff that's been happening, bullet point style! Ever since I went to last years Trojan Horse was a Unicorn event (which is one of the best things ever if you are a digital artist and want to be inspired for a couple of months) I realized that business cards weren't just for entrepreneurs and business savvy people, as every single person in that event had their cards ready to hand out to extend their networks. 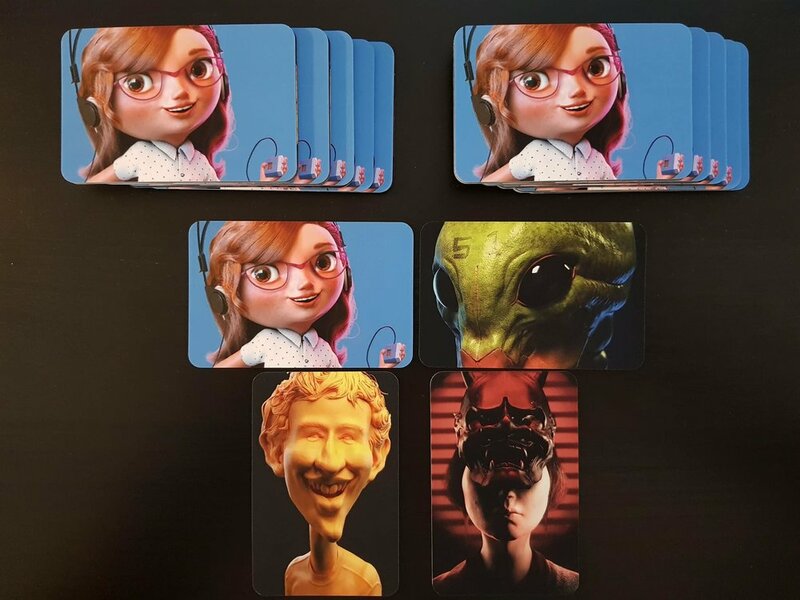 So last month I ordered some pretty simple cards from the awesome people at Moo.com. Seems pretty trivial, but since my work lives exclusively inside computer screens I never even considered that more traditional ways of letting people know my work was something worth investing on. Now I have all these cool cards for anyone who wants some! Meanwhile, work still continues on my studies to build a CG character model ready for real-time engines. I'm still at the modeling phase, working out design choices and figuring out new ways to tackle more complex hard-surface assets. I'd say it's coming along pretty nicely for the purpose of learning, but I'm slowly dreading the low-poly phase as I have no idea how I'm supposed to make this work with low geometry (perks of always having worked high-poly I guess). Finally, the studio has dropped another BTS of the last campaign we worked on, which turned out to be really fun to make! Having worked mainly for video and animation, I never got around exploring real-time workflows, but it always stuck as something I should get around doing one day. Well, this year I started with just that, thanks to Mold3d Character Creation for Video Games with character artist J Hill! Progress is slow, as studio work never ceases to slow down, but I'm already having tons of fun doing it! I was lucky to get the approval to work on this awesome concept by artist Gouf Gouf. I fell in love with the shape language, details and all the crazy non-organic armor and gauntlet stuff going on. My plan now is to take as long as it takes to bring this character to life in a real-time engine. Will be posting more updates as this evolves. It's pretty cliche to start a long-delayed blog post by apologizing and saying how sorry I am for the lack of posts. But as the year gets closer and closer to the end, the neverending stream of projects never seems to slow down, and the time I wish I had to dedicate to this section of my little web space gets eaten up by other priorities. As a small treat here's a making-of/BTS done for one of the last projects I worked on for Studio Nuts! This shows really well all the madness that goes behind a single ad campaign and the small (but extremely fun) part we at the studio take in! Time does fly when you are having fun! Unfortunatly, as time flies off so does some of the plans I had for the blog. The reason I haven't uploaded anything for a while is simple: not only has the workload at the studio skyrocketed, I've also been attending an online workshop with Zbrush artist Pierre Benjamin (https://www.artstation.com/pierrebenjamin). It has been a FANTASTIC learning experience that I highly recommend to any fellow Zbrushers out there. 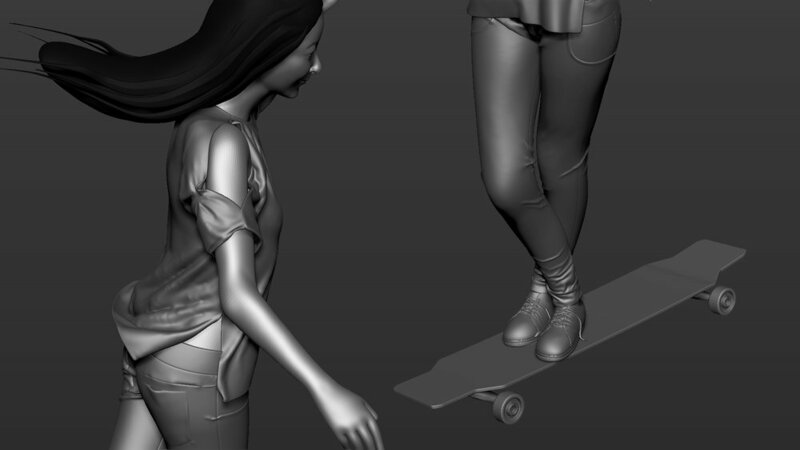 Throughout we've been doing several assigments to practice anatomy, clothing, hair, etc. 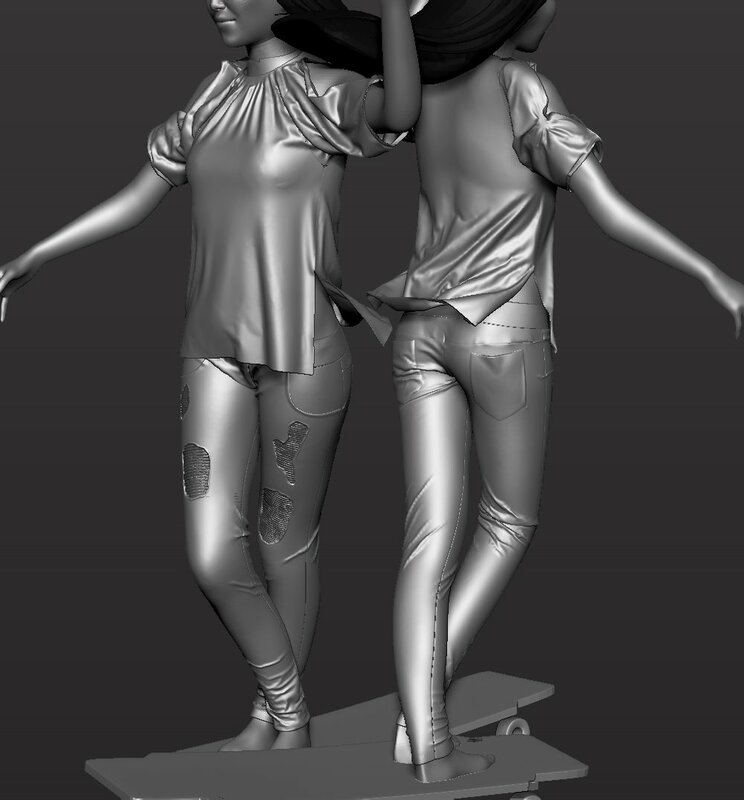 After we're done I'll do proper renders of all the sculpts I'm working on, but untill then I'll leave a couple of WIP images here so you can get a taste of what we are practicing. You can also check my Artstation account as I have some of these pieces there. Timelapse (2x) of me working on the skirt detailing as well as some details on the cloth hanged in the alter. As the days roll by and the workload never ceases, I've been working on a side project between rendering hours to catch up with my sculpting skills. Decided to work on a illustration based on the folk figure of Santa Muerte, a somewhat controversial Mexican saint (not recognized by the Catholic church) that's gathered a huge number of worshipers in Latin America. PS: Please ignore the HUGE mistake I did inverting her left hand (that is not where the thumb should be) eh eh! As I was pondering about my plans for this current year I noticed that I've always been terrible at presenting myself outside my work. This is something I'm hoping to change this year, starting right here in the blog. If you've visited my website before, you may have come across the old "blog" I had, which consisted only of various WIPs and loose images with little to no context. I've decided to do a little cleaning and renew this section! I'm still in the process of thinking how this is going to work out... lately I've been considering ways to further share what I do that would come in handy to everyone who may come by here, and writing some of my thoughts on the way I work, how I work, and what I'm working on, seemed like a nice idea. If you want to follow along, than I suggest you drop by here in a couple of weeks, so we can share some ideas together! Here you'll find some R/D shots, unused concepts, workflow insights, test renders, and other stuff I'm working on! Prepping my next project. Been wanting to work on a realistic portrait for a while. 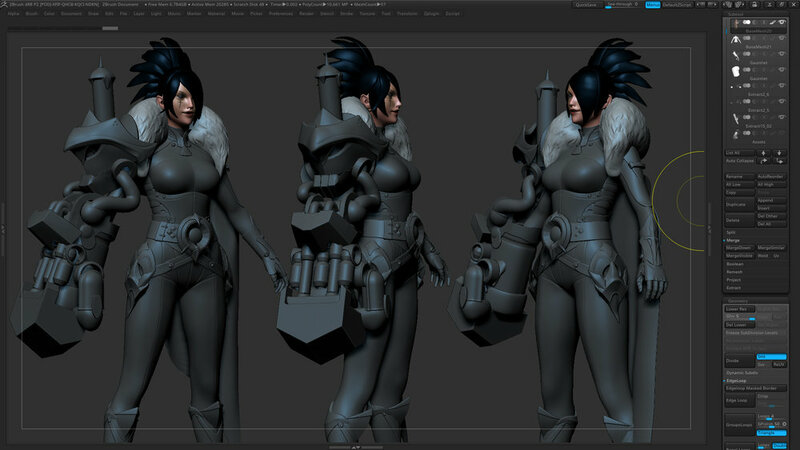 First anatomy pass done on #zbrush got some issues to address before sketching the clothes and accessories. My contribution for #sculptityourself so far. Added some dramatic lighting to check the forms out from the second study. This project has been a long learning process for me considering I have never done anything for real-time purposes, and even though I feel like starting it all over again and avoid all the mistakes Ive made, Im pretty happy with where I got. Still have to tweak the hair, eyes and some paint job. Had a BLAST working on this little gal with the super talented team @studionuts, Showoff and Mola. Came out perfect! Kicking off the new year with some relaxing sculpting session today.